Are you looking for information on trekking in Goecha la? Learn how to plan for an amazing trek in Goecha la. Is a mountain pass in Sikkim, India. This is part of the famous Himalayan range. Mt. Kanchenjunga, world's third highest mountain, can be viewed from Goechala pass. Other than Kanchenjunga, one can spot various mountains like Pandim, Talung, Kabru, Simvo during the trek. Goecha La trek is a circular trek with total trek distance of 87 km. 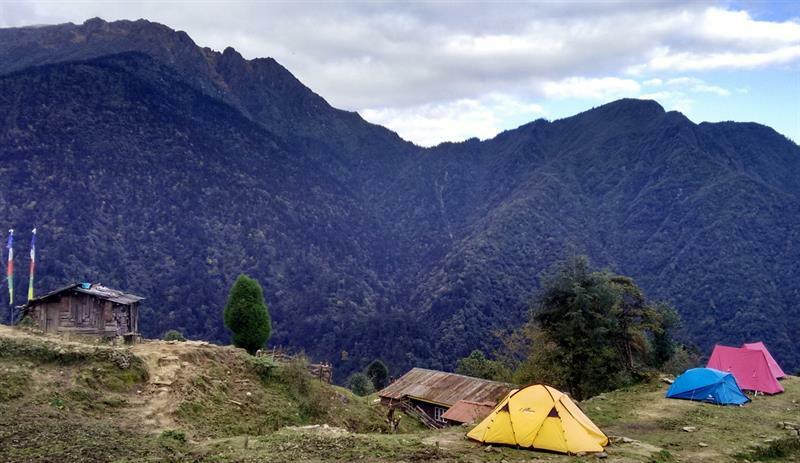 The base camp for Goecha la trek is a town in Sikkim. It is situated in Rathong Chu valley. Yuksom is very famous for eco-tourism and monasteries. Our plan was not a sudden one. 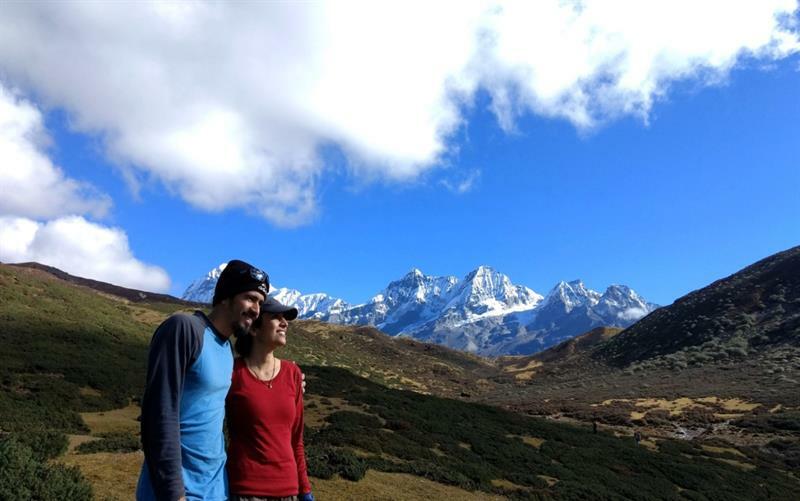 We had made up our mind for a second Himalayan trek the moment we completed our first one, Kedarkantha in Uttarakhand, India. We did Kedarkantha last December during Christmas. It was a high altitude snow trek and an easy one (not so easy though) for the beginners (in Himalayan category) with the duration of 5 days. We couldn't have imagined a better place/trek to celebrate Christmas and our second wedding anniversary with our bunch of favorite people. This year we aimed at a higher one, in terms of altitude and difficulty level. 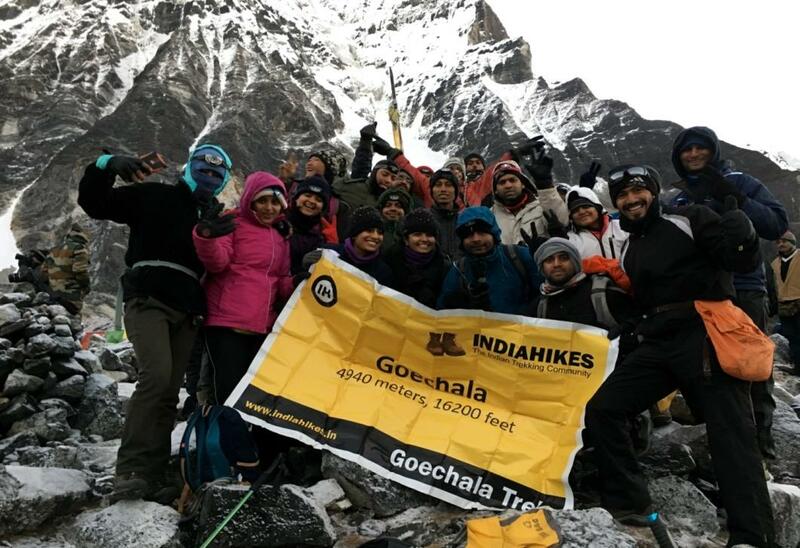 After browsing through various blogs, IH site, and a few youtube videos we and friends zeroed in Goechala for exploration and we chose India Hikes (IH). I and Tej (my Husband) never gave it a second thought as Goecha la trek is supposedly the most romantic trek in India. Initially, it was 5 people in the gang and gradually the gang grew up to 10 people. Finally, it was 10 of us (4 girls and 6 guys) who were headed to one of the most difficult treks up north (east). We departed from Bangalore on 15th October 2016 on an Air India flight and reached Kolkata in about 2.5 hours. Explored a bit of Kolkata before heading to Sealdah. We boarded our train Darjeeling mail, from Sealdah at 10.00 pm on 15th October and reached NJP at 8 am next morning. We could already feel the aura of trekking as we saw quite a few people walking past with their hiking gears. 16th Oct 2016 - NJP to Yuksom, 150 km, 8 hours. "Bad roads but a good safari"
We contacted the vehicle drivers Mukesh and Dena, dumped our luggage and were all set for our journey to Yuksom, the base camp for Goechala trek. It was around 9.00 am when we started. We stopped at "Laddoo Gopal" in Siliguri for breakfast. We gorged on some amazing chola baturas, puris and dosas. The rasmalais were mouth watering and I ended up eating 3 of them. We hopped on to our respective vehicles. Initially, there were small traffic jams as the roads were badly affected due to landslides.However, I could not forego the window seat as I wanted to enjoy the scenic beauty and click loads of pictures. The journey was nothing but splendid. 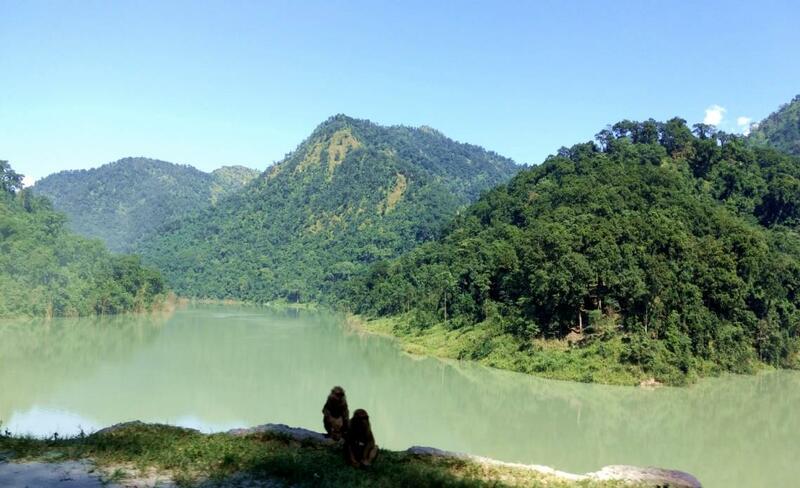 There was greenery, beautiful Rangeet and Teesta rivers, small markets with colorful veggies, hanging bridges, temples, waterfalls and water streams flowing across the roads. By now I had a small notion of what would be in store for us. Roads were in a bad condition for a few kilometers , but this did not bother us much as Dena's awesome collection of Hindi and Nepali songs kept us happy and awake most of the time. We stopped for lunch at a small house restaurant and ate some hot Maggi and aloo paranthas. We knew we were heading closer to Yuksom when roads started getting narrower. It was just about 5.30 pm and the night had arrived already. We reached Lanam Cottage in Yuksom, at around 7.00 pm. We collected our luggage, settled the taxi fare (cost about 1000 Rs per head) and checked into our rooms. There were three of us girls in one room and were happy to see decently maintained room and bathroom. We were told to assemble at 8.00 pm with our medical certificates, photos, and ID proofs. We literally dug our bags for these required items, ran out to the assembly point and handed over the documents. Here we met our trek leader, Tanmay Bain who noted down our BP and oximeter readings. Soon after, there was team introduction and Tanmay gave us a handful of information that I will never put my mind. To mention a few, he enlightened us about AMS, HAPE, HACE facts and myths, backpacking method, team decorum, time management and the purpose of carrying eco bag. I immediately ran to my room to recheck the things I had stuffed in my trek bag, removed almost half the unwanted stuff and was proud of myself for this small achievement. As all high altitude trekkers do, we enjoyed our last bath in civilized bathroom and our super slumber in cozy beds. 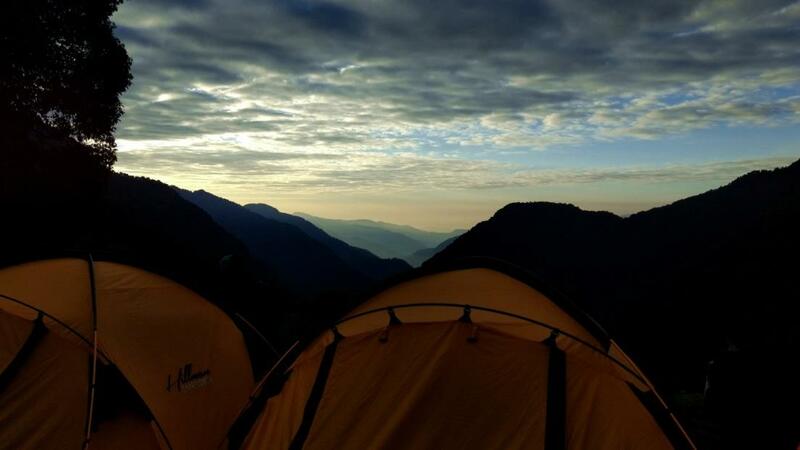 17th Oct 2016- Yuksom (5770 ft) to Sachen (7200 ft), 8km, approx. 4.5-6 hours. "Monday morning! No work, just trek, bridges calling"
As the alarm rang at 5.30 am, we sorted out our luggage to be kept at the base camp, got ready, ate breakfast and set out with our trek gear at sharp 9.00 am (we were late by 1 hour). Tanmay's time management lessons gone for toss on the very first day. 20 of us looked smart in our trek attire. One thing to remember was smart look wouldn't take us to Goechala summit, but self-motivation and mental strength definitely would. We were introduced to our local trek guides Gurungji and Mohang. The rule was that Tanmay, Gurungji and Mohang would take turns for leading, sweeping and being in the middle and this would be the case for next 8 days. I was reminded of Tanmay's beautiful words "We are not trekkers, we are Mountaineers" as I walked past Yuksom village and beautiful valleys. The trail was a decent one with the narrow walkway and mixed forest. There was not much sunlight peeping in due to trees standing tall on either side. Very soon we reached bridge-1, over Pha Khola stream. A huge arch "Welcome to Khangchendzonga national park" welcomed us. We stopped here for a shot break while Tanmay briefed us about the significance of Khangchendzonga which houses varieties of animal and plant species. 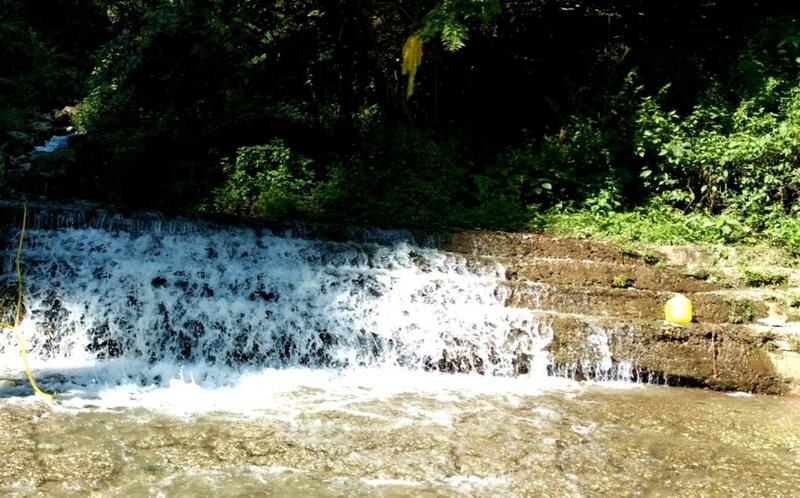 After few long ascents and short descents, we heard a loud noise of flowing water. We approached bridge-2 over the pretty Prek Chu river. Prek Chu looked extremely beautiful. Tanmay informed us that our affair with Prek Chu wouldn't end very soon. We ate our packed lunch midway during a brief stop and reached out first campsite Sachen in 4.5 hours. Our porters carrying our tents arrived after a while. Tents were pitched, while we saw how it was done. Sachen was a small camp site above the trail with a log hut close to a trail which was used as the kitchen. Sachen had beautiful valleys all around and dense forest on one side. Tanmay got us to play few fun games where we got to know more about every person in our team. We were served hot onion pakodas and chai at 5.00 pm. There was the health check up at 7.00 pm and dinner at about 7.30 pm. Soon after dinner, bid good night to Tej and hit my tent. It was me Shilpa and Prasiddha, my buddies for life in one tent. Recollected our timings for next day (5.30 am chai, 6.30 am Breakfast and 7.30 am departure) and slipped into our sleeping bags. 18th Oct 2016- Sachen (7200 ft) to Tshoka (9650 ft) via Bakhim), 7 km, approx. 5 hours. "Our first glimpse of snow capped mighty mountain Pandim"
This was supposedly a short trek but the altitude we gained was huge. Started at 8.30 am from Sachen, an hour delay from the planned time. Very soon we reached bridge-3, the second one over Prek Chu. Colourful Buddhist prayer flags fluttered while beautiful Prek Chu just shied away. After clicking few pictures, we started to climb. 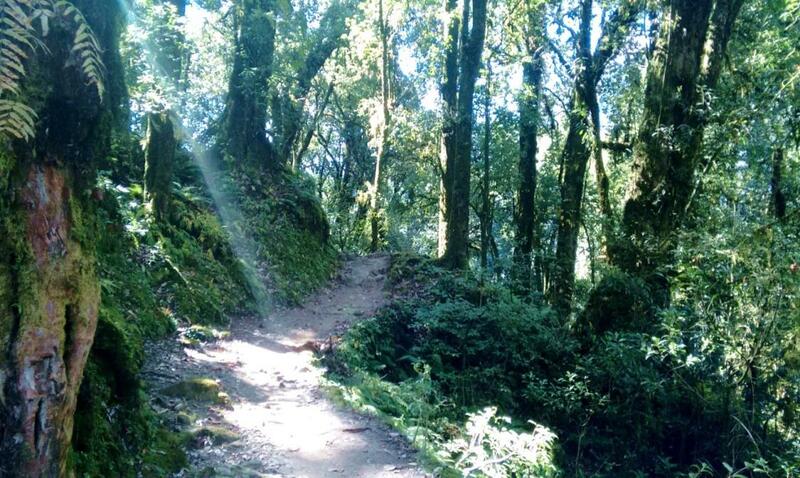 Trail was through a mixed oak forest, stony, with the steep ascent.Sunlight played hide and seek while the trekkers huffed and puffed. After crossing a few steep ascents and stunning views we reached Bakhim (8600 ft). There was a hut and resting place with a view to die for. 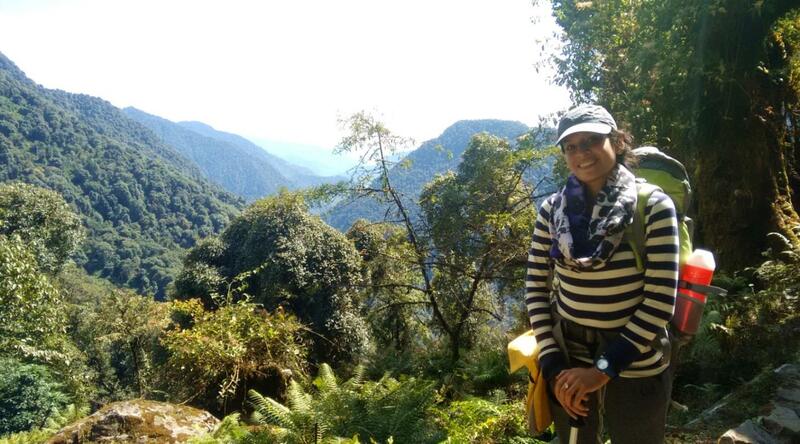 We ate our packed lunch enjoying the Yuksom valley view and lush green forest and glimpses of rhododendrons. We resumed our journey though Bakhim's beauty held us there for long. We reached Tshoka at 5.00 pm after climbing for a couple of hours. We were tired but the bewildering beauty of Tshokan meadows eased out our tiredness in no time. 19th Oct 2016- Tshoka (9650 ft) to Dzongri (12980 ft) via Phedang (12050 ft), 9 km, approx. 7 hours. "Tryst with Rhododendrons, a realization of the level of difficulty. Oh no AMS moment!" Woke up to a pleasant, clear and beautiful view. As per the schedule, we finished our morning activities, un-pitched our tents (yes we did), got our briefing from Tanmay and marched ahead. As we climbed up a few yards, we got an alluring view of Ashoka lake. After a brief steep ascent, we were welcomed by rhododendrons on either side of the trail. To add to our joy there were wooden logs (gave us a royal feel) lined up on the trail. Rhodendrons though not in their full form had a few decorated red patches which gave us a park kind of feel. The trail made way to stones and mud, which we climbed to reach our lunch spot Phedang. Clouds had arrived by now and we did not get a good view at Phedang. The general weather pattern throughout the trek was bright sunny mornings (lucky us), cloudy mid mornings, super cloudy afternoons and dark evenings. Mantra was to start early from the camps. Short Rhodos accompanied us from Phedang to Dzongri, a trail was stony with small streams crossing you very often. When we thought we finally reached Dzongri, Gurungji in a mild tone informed us that the camp site was occupied and we had to walk more upwards to reach our next campsite in Dzongri. We had no choice but to follow Gurungji. We were elated to see yellow tents waving at us at 6.00 pm. Dumped or trek bags and rested for a while. Oximeter readings were checked and most of our readings were pretty low. Thanks to the altitude and dehydration. Tanmay told us to sleep early as we had to start to Dzongri top at 4.30 am. I was feeling good when I slipped into my sleeping bag and fell asleep in seconds. Woke up at 3.30 am and was all set to go at 4.30 am. Tej filled up our water bottles and he noticed that I wasn't super enthusiastic (like always) and was really down. My eyes started rolling, a body was shivering and I was dizzy. I saw Prasi and Shilpa climbing up. Tej and Mohang looked at me with great concern when I told them I wanted to go back to my tent. I sacrificed Dzongri top for Goechala summit. I had to save myself for the big one. I told Tej to move ahead and requested Mohang to take me back to the tent which was hardly a few yards away. 20th Oct 2016- Dzongri (12980 ft) to Thansing (12894 ft) via Kockchurang (12096 ft) , 10 km, approx. 6 hours. "As romantic as it could get." Woke up to Prasi and Shilpa's voices. Explained my early morning condition to Tanmay and he just said well. I was still afraid if AMS had hit me and suddenly Tej dragged me out of my tent to show me the spell binding view of mountains against blue sky. It was a row of White Mountains on one side (Pandim and others) and a row of green mountains on the other side. I jumped with joy and ran around like a maniac. Tej helped me click few pictures and we had a great morning. After breakfast I felt much better and confident. I was still sad for not making it to Dzongri top but was happier to realize that it was not AMS but fatigue and dehydration. Tanmay told us that Pandim would be a regular sight from now. It was a steep stony descent which tested ones fitness level to maximum. Trail offered us some great views of gorges and meadows with Prek Chu peeping in. Reached Kockchurang and halted to eat our packed lunch. It was a pretty sight with a small log bridge over Prek Chu. Moved from Kockchurang, from there on trail was as romantic as it could get. It was lined by rhodendrons on one side and milky prek Chu on the other side. When we reached Thansing there was cloud blanket all over. It was 5.00 pm and was cold. All twenty of us got together outside, played games, ate snacks and dinner and bid good bye to the day (day!). 21st Oct 2016- Thansing (12894 ft) to Lamuney (13693 ft), 4 km, approx. 2-3 hours . "Calm before storm"
We got some extra sleep and woke up late (6.00 am and late!) that morning. We got a much closer view of mountains from Lamuney. Trail was flat with Prek Chu quietly flowing on one side. We took a long break midway just to enjoy the pretty sight. Reached Lamuney in about 3 hours. It was close to 1.00 pm when we got hot lunch. Lamuney was windy and cold by then. We assembled in kitchen tent, saw the movie Into thin air. One couldn't have asked for more on the day before the summit! We relaxed and hit our tents by 7 as our wakeup call was to be at 1.00 am. 22nd Oct 2016- Lamuney (13693 ft) to Goechala (16000 ft) and back to Kockchurang, 18 km total, approx. 13 hours. "At the Zenith!" I woke up at 1.00 pm, got ready quickly. We the team started at 2.30 AM. Tanmay had given us a queue sequence which we followed up to the summit. The slowest ones in the team led us from the front. This helped us manage the timing. We surrendered ourselves to the small beam of torch light to lead us up to summit. We crossed Samiti Lake and reached Goechala just in time for sunrise. Good planning made our summit climb look so easy. At view point 1, we cheered aloud as the sunlight light fell on mountain row. It was the panorama of Kabru Mountains that we saw first. Gradually the light shone brighter and turned golden all of a sudden. Sunlight uncovered the spectacular Kanchenjunga with his golden touch. We witnessed the third highest mountain in the world in her golden avatar. We clicked our signature summit picture and headed to view point 2. Soon the weather got bad and the entire area was covered in clouds. 3 of our trekkers were led by Gurunji to view point 2 where as the rest of us decided climb down to Lamuney. We descended fast and halted only at serene Samiti lake to admire the beauty and capture Samiti in our cameras. We reached Lamuney at 10.30 am, rested in our tents and got some good sun. Our 3 trekkers completed view point 2 successfully and reached Lamuney at 1.00 pm. We ate hot lunch and headed to Kockchurang (via Thanking). It was a long journey ahead and a difficult one for those who visited view point 2. Reached Kockchurang at 6.30 pm. There was a log hut which housed 20 of us that night. We ate dinner, played cards and hit the sleeping bags on wood. 23rd Oct 2016- Kockchurang to Bakhim. "Beginning of Goodbyes"
Trail was a flat one with intermittent ascents at few places accompanied by Prek Chu and Mt. Pandim on left. Trail slowly transformed into a roller coaster with very narrow paths. We ate our packed lunch in Phedang and further descended to Tshoka at 4.00 pm. Our team decided to climb down to Bakhim (via Tshoka minus Dzongri and Phedang). It was already dark by then, making it even more difficult to walk on a stony trail. We reached Bakhim at 7.30 pm, recollected the best moments of our feat, laughed our hearts out and went into our tents with immense respect for each other in our hearts. 24th Oct 2016: Bhakim to Yuksom "The end or just the beginning"
While we descended we were left wondering whether we really climbed up those gigantic trails! Reached Yuksom in the noon, ate hot Maggi and Momos. Tanmay handed over our accomplishment certificates. We expressed our heartfelt gratitude to Tanmay, Gurungji and Mohang. We bid good bye (to meet very soon) to few of our teammates who left Yuksom the same day. We (Me, Tej and our friends) stayed back at Yuksom that night. Explored Yuksom market, visited a monastery, had dinner at a local restaurant. We headed to Gangtok the next day (26th October 2016). We completed Goechala, one of the difficult treks with no signs of rain at all. But I and Tej were left wondering if it was the end or a beginning of something new! Himalayan mystery is not easy to unravel. Below are a few tips that will ensure a hassle free Goechala trek and many other long duration high altitude treks. The Do's and Don'ts which will ensure a wonderful trek. Have listed some of my learning lessons. Do check. Hope my Goecha la trek experiences and learning will inspire you to plan a trek to Goechala and will make your trek even better. Amazing Divz. Very inspiring and also very exciting. Was Imagining every bit which you have explained. Wish I could also be a part of it. But will never miss the chance of exploring Himalayas. Thank you so much for inspiration. 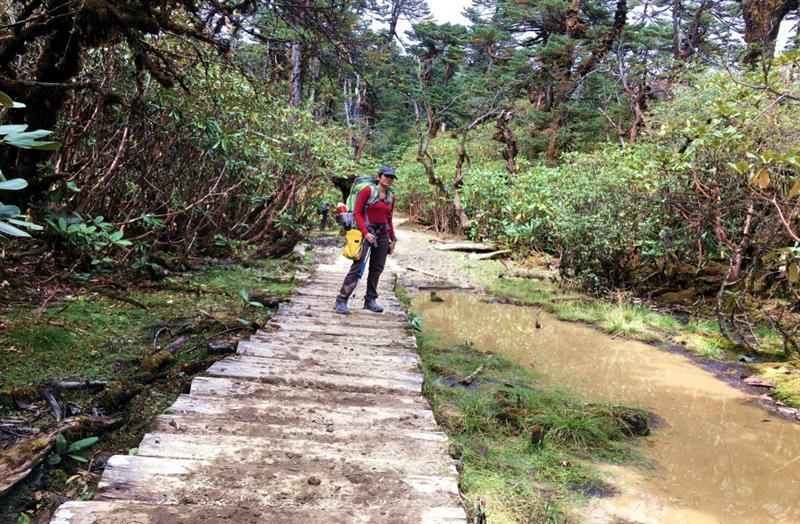 Beautiful article on trekking at Goecha La. Very informative with and eye for detail. Amazing trek WOW experience. 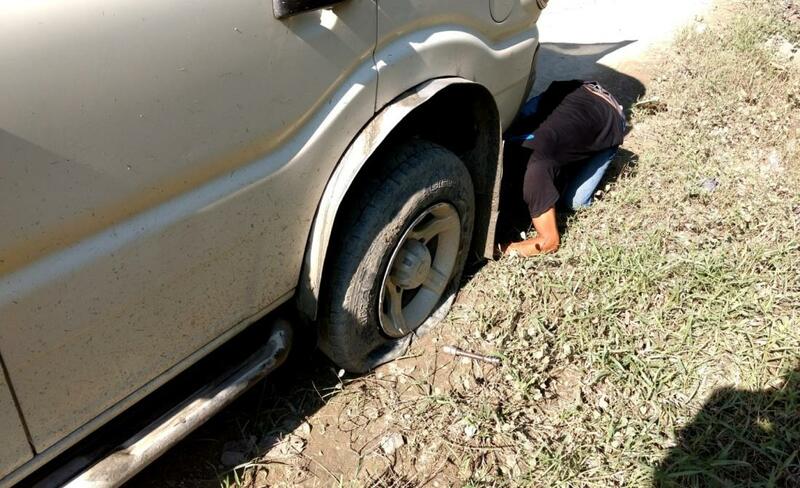 Hats off guys. I got to read this marvelous article through Prasiddha. Thanks Prasi for taking me to this great article. 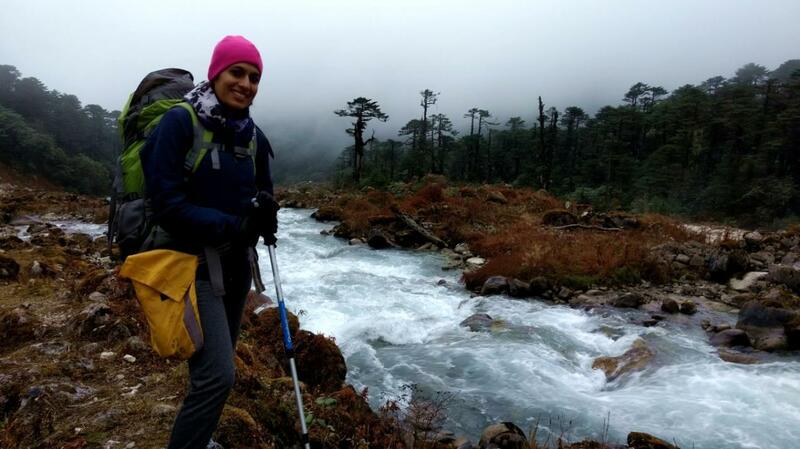 Getting inspired for a Trek myself after reading this Goecha la trekking experience - very honest on this! That's an amazing article on Goecha La trekking experience. The information provided is very helpful & interesting...wish I could be a part of it. I feel the article is very inspiring & motivating. The entire article is beautifully written describing all the events that took place during this trek. Additionally, the do's and don't section at the end of the article is very useful for everyone who wish to do trek in future as well the ones who regularly does. 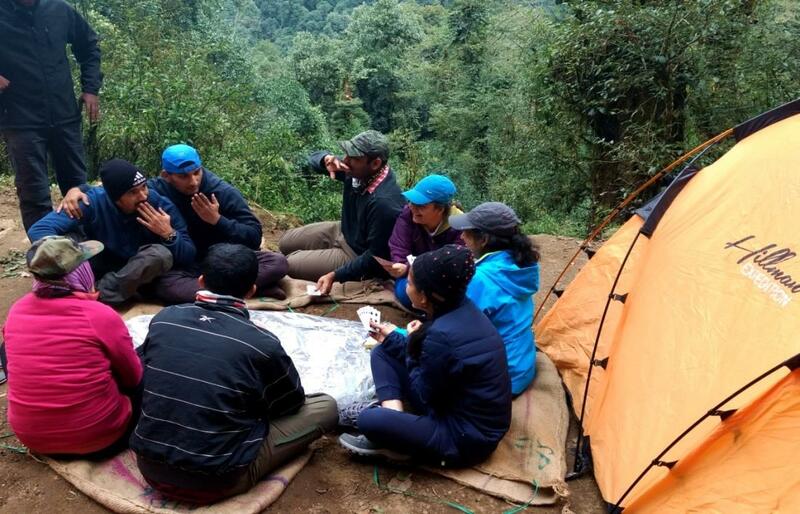 Goecha La could be the learning experience for the ones who wish to make their career in trekking and mountaineering. Thank you Supraja. We would be happy to see you with us next time. Thank you, Sunil. Glad you like the post. Thank you Rajeshwari. So all set to join us for our next trek? Thank a lot Akash. 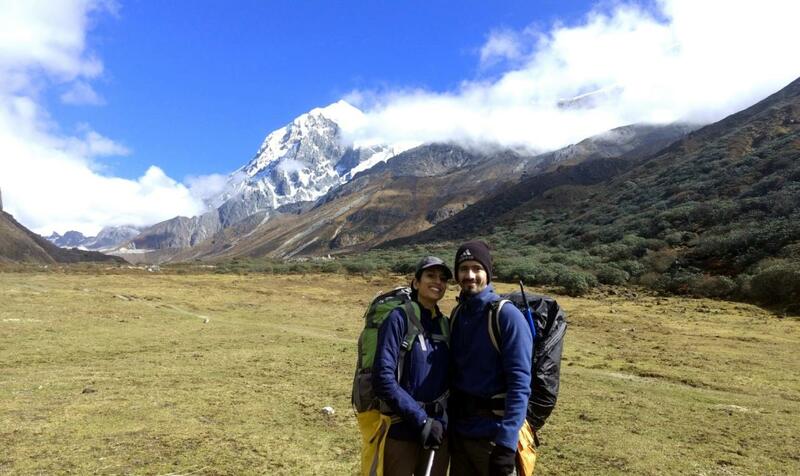 As this is the most romantic trek, who better than wife? Let me know your experiences after you guys successfully do Goechala. Subhankar, It's never late. Go for it.Thanks for your encouraging words. Thank you Ravi for your detailed review and positive words.Yes, Goechala is one the most difficult treks and the experience is just out of the world.Hope you too do it soon. 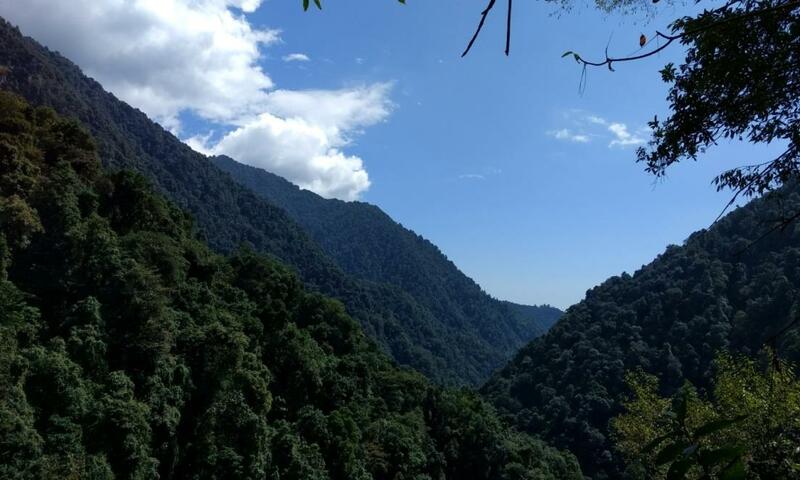 Nice Post regarding Goecha La, a high mountain pass in Sikkim, in the Himalayan range.